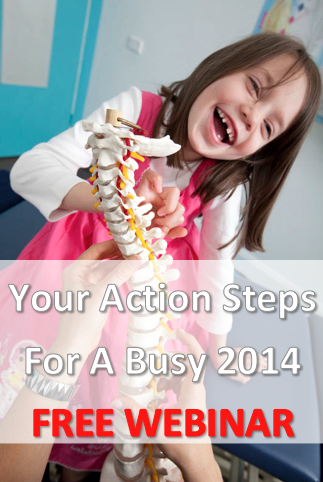 With 2013 drawing to a close, it’s the perfect time to set new goals for 2014 and really get on track and focused in getting even more children into wellness care! And to help get you ready to hit the ground running, I have put together a free webinar that is jam packed with actions that you can implement easily and immediately to get more kids in your practice enjoying a healthier life! We will cover the top 5 areas that parents need more advice in and easy actions that you can start using immediately. The webinar includes what reports to use, checks to do, topics to discuss with parents and important milestones. We will focus on what you need to organise in January & February 2014. If you can’t make the live webinar, be sure to register so that you get the link for the recording sent to you afterwards. And as always if you have any ideas or questions please feel free to contact me, I would love to help you build a practice full of kids!